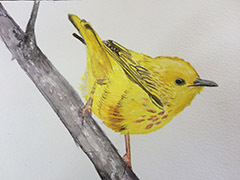 Friday I painted this yellow warbler and three days later(today) I saw one out of the blue. How unlikely is this? We think of something or someone and there they are. It often happens with people but rarely does it happen so easily with something as elusive as a bird.